This volume is one of various text layout/formatting and index projects done for Africa World Press, Trenton New Jersey. The book is available for order on the company's website- http://www.africaworldpressbooks.com/servlet/StoreFront and all major online retail stores including amazon.com and Barnes and Noble. This book identifies the institution of chiefship as the focal point of the critical discourse on continuity and social change in colonial and postcolonial Botswana. Analyzed within an expansive social and political context, the institution of chiefship represents a critical domain for the articulation of local values and aspirations in a rapidly changing, twentieth-century Botswana. 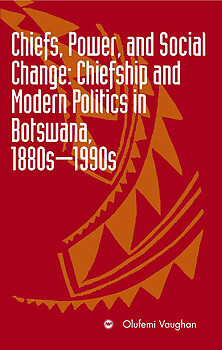 While it underscores the central role of chiefship structures in the historical processes of state formation, this book also analyzes the transformation of the institution of chiefship in three major themes of modern Botswana’s political history: Botswana’s encounter with British imperial rule; the decolonization process of the post-World War II years; and the nation state project of a nationalist elite in the ongoing postcolonial period. Vaughan clearly illustrates how chiefship serves an effective medium for the analyses of complex expressions of local politics during colonial rule and the developmental policies of modernizing elites in the postcolonial era; and how it has sustained itself as a platform for the re-construction of traditional hierarchies of power amidst the social stratification, communal identities, and spatial relations of Botswana in the twentieth century. OLUFEMI VAUGHAN is professor in the Department of African Studies and the Department of History at State University of New York Stony Brook and also serves as associate dean of the Graduate School. His book Nigerian Chiefs: Traditional Power in Modern Politics, 1890s-1990s (University of Rochester Press) won the Cecil B. Currey prize of the Association of Third World Studies in 2001.